These measures, once unorthodox but now familiar, have pushed Japan’s banks, insurance firms and ordinary savers into buying foreign stocks and bonds that offer better returns than are available domestically. Indeed, Japanese investors have loaded up on short-term foreign debt to enable them to buy even more. 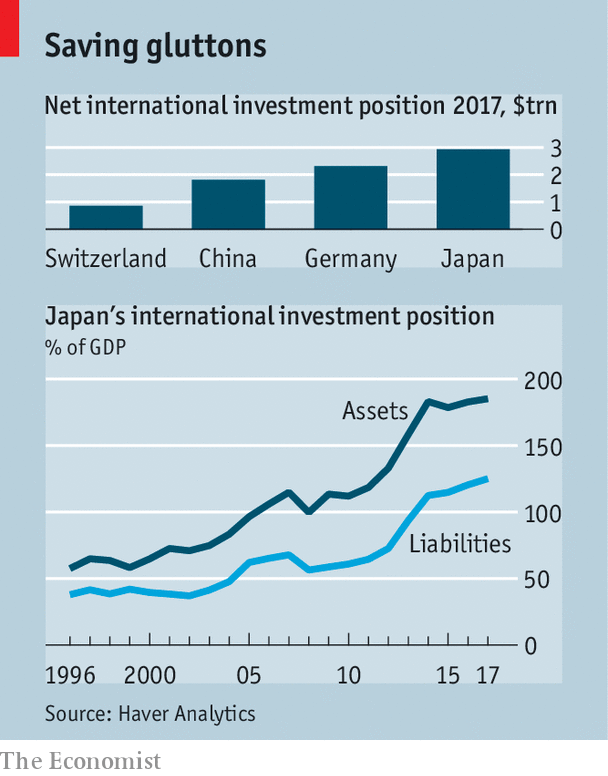 Holdings of foreign assets in Japan rose from 111% of GDP in 2010 to 185% in 2017 (see bottom chart). The impact of capital outflow is evident in currency markets. The yen is cheap. On The Economist’s Big Mac index, a gauge based on relative burger prices, it is the most under-valued of any major currency.